A quick and easy cake stand centrepiece for Halloween. 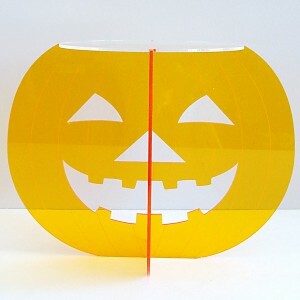 The pumpkin cake stand will soon be your “puun-kin” sweetheart. With a flat-pack design that slots together in seconds, you’ll have a centrepiece for any Halloween celebration quicker than the wink of a witch. The plate is clear and flush with the top of the pumpkin so it can accommodate a larger cake board to sit on top. Product specifications: 3 mm acrylic; flat-pack design for convenience. Available in amber only. height 22 cm; width 29 cm; top plate diameter 18.2 cm. Check out the rest of our spooky range here! Our flat-pack design means it can be assembled and disassembled in a flash and stored flat to use again and again. Gentle hand wash in warm soapy water or simply wipe clean.